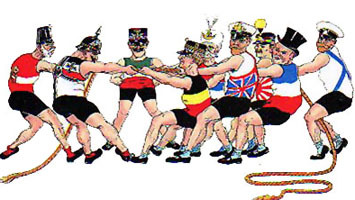 For a brief few Units in the summer of 1914, it really did seem like a tug-of-war was going on between countries, "to go to war or to not go to war." (In reality, most countries were ready to go to war.) See, if you can identify the participants depicted in this caricature. Read the textbook chapter 31, especially pages 415-20. Check the remarks by Professor Blois and Professor Evans on World War I.
Tsar Nicholas II & Kaiser Franz Joseph I Keksgolmsky Regiment March "The Emperor of Austria"
See also the videos dealing with World War I in the HIS 102 course. For 50 points maximum extra credit, watch Rasputin and explain how and why this happened in a one-page paper! For 50 points maximum extra credit, read Barbara Tuchman, The Guns of August (1962) and write a one-page paper in which you explain what went wrong for the Russian army in the first two months of the war. For 50 points maximum extra credit, read W. Bruce Lincoln, Passage through Armageddon: The Russians in War and Revolution, 1914-1918 (1986) and write a one-page paper in which you assess the impact of the war on Russian society. For 50 points maximum extra credit, read Aleksei Brusilov, A Soldier's Notebook (1930) and write a one-page paper explaining Brusilov's role in historical events. For 50 points maximum extra credit, read Edvard Radzinskii, The Rasputin File (2000) and write a one-page paper explaining "how" and "why!" For 25 points maximum extra credit, read the "Willy-Nicky" Telegrams, exchanged between tsar and kaiser, 29 July - 1 August, 1914 and write a paragraph in which you assess these rulers' grasp on reality. You can also read the tsar's August 1914 manifesto announcing the start of the war to the Russian people.